What are the pros and cons for an interior versus an exterior chimney? We’re working on a limited budget and need to build something that won’t break the bank either now with the construction costs or later on with the electric bills. Although many homeowners prefer to tack their chimney on the outside of the house to maximize floor space inside, a properly designed interior chimney will almost always heat your home more safely and efficiently, and will require less maintenance than an exterior one will, says Ashley Eldridge, director of education for the Chimney Safety Institute of America. “With a hearth in the middle of the home, any heat lost from the mass of the chimney itself stays in the room,” says Eldridge. 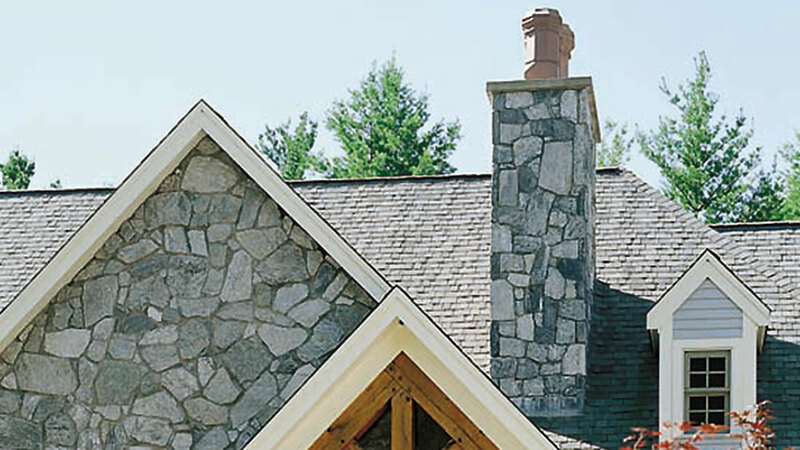 “With an exterior chimney, you lose that heat to the outside, in addition to other adverse cooling effects.” A fireplace must maintain a very high temperature for the fuel inside to combust completely, but exterior chimneys, stuck out into the wind and cold, tend to foster a cooler burning temperature. As a result, creosote (a tarry buildup created by incompletely combusted oils found in wood and fossil fuels) can accumulate to several inches thick in a chimney, causing a major fire hazard. A well-ventilated, centrally located chimney is more likely to burn fuel more cleanly, reducing your energy bills along with the need for regular maintenance. To maximize your chimney’s safety and efficiency in making your home as warm as possible, position your hearth in the center of your home and extend the chimney up through the ridge of the roof, making sure it rises a minimum of three feet above the roof and two feet above everything within 10 feet.